The EAA by My Supps are 100 % essential amino acids, suitable as dietary supplements for athletes. 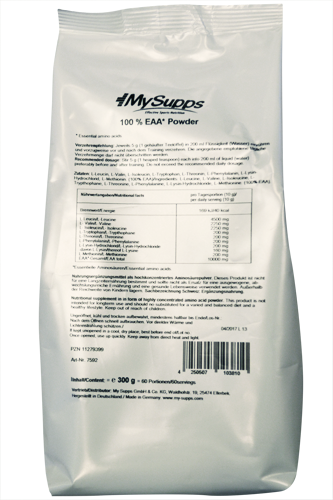 MySupps 100% Amino EAA contains the essential amino acids Leucine, Valine, Isoleucine, Tryptophane, Threonine, Phenylalanine, Lysine and Methionine. Essential means: vital for humans as the body is unable to produce these amino acids itself. Worth knowing: What effects do amino acids have on the body? Leucine, Isoleucine and Valine are among the BCAA (Branched Chain Amino Acids). They are involved in the energy metabolism. Tryptophane plays a part in important metabolic processes. Threonine is a significant building block in many proteins and is found with particular frequency in collagenic connective tissue. It shares responsibility for strong bones and teeth and also for elastic sinews and tendons. Threonine is also involved in the immune system, as it is an important building block in antibodies. Among other things, Phenylalanine is a precursor substance for the amino acid Tyrosine, which is produced in the liver. It plays a part in the production of insulin, melanin and the thyroid gland hormones. Like Threonine, Lysine is also important for the stability of collagenic connective tissue and is also an element in many enzymes, hormones and antibodies. Lysine is also involved in the production of L-Carnitine and therefore indirectly influences lipometabolism. Methionine plays a part in many detoxification processes in the body and also in the regulation of the acid alkaline balance. Worth knowing: What are essential amino acids? A total of 20 amino acids are known, acting as the smallest building blocks in proteins and assuming a variety of tasks within the body. A distinction is made between essential, semi-essential and non-essential. The first are vital for the human organism, as the body is unable to produce them itself. The semi-essential amino acids are only essential in certain situations, as the body is unable to produce sufficient quantities by itself, e.g. during illness or significant exertion during sport. The body produces its own non-essential amino acids. This is why they require no supplement in daily nutrition. What products can I sensibly combine with MySupps 100% Amino EAA? With Body Attack Power Protein 90, which can improve building and preserving muscles during intense muscle training. With MySupps 100% Creatine Monohydrate, which can improve performance in brief muscle training. With MySupps 100% Arginine, which activates blood flow of the muscles during training.